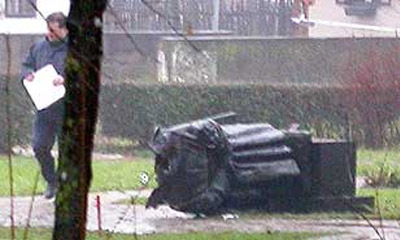 On Dec. 27, 2004 a monument to Yugoslavia's late antifascist fighter and communist leader Josip Broz Tito was blasted with an explosive device in his native village of Kumrovec in northern Croatia. 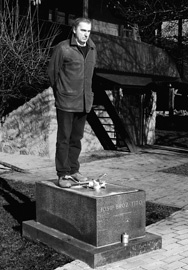 Conceptual and media artist Dalibor Martinis took the emptied post on the pedestal to commemorate this date. On January 14, 2005 Martinis did a performance at the Gallery OK in Rijeka in which he reenacted the event of decapitation of Tito�? ?s sculpture by cutting the head of a small bronze replica. These performances provoked intense media coverage and started the discussion about the collective denial syndrome of Croatian recent history.